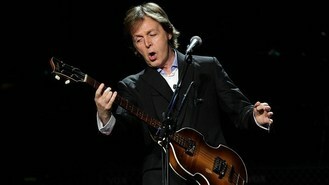 The former Beatle and his new wife are worth £665 million, according to the Sunday Times Rich List. Last year's list had Sir Paul's personal fortune pegged at £495 million but it has increased due largely to his wife's £150 million stake in her family haulage business. He has also pulled in £20 million from performing and album sales and is third in the Sunday Times Rich List Music Millionaires Top 50. Above him are theatrical producer Sir Cameron Mackintosh whose personal wealth is estimated at £725 million and record industry executive Clive Calder whose fortune is said to be £1,350 million. Lord Lloyd-Webber is fourth in the list with a personal fortune of £590 million, down from £680 million the year before. The four members of Irish rockers U2 and their manager are in fifth spot after their combined fortune rose by £59 million to £514 million. Also in the Top 10 are David and Victoria Beckham whose joint fortune has risen by £25 million to £190 million. They are tied in tenth place with Rolling Stones frontman Sir Mick Jagger and new entry Daniel Ek who founded the digital music download service Spotify.